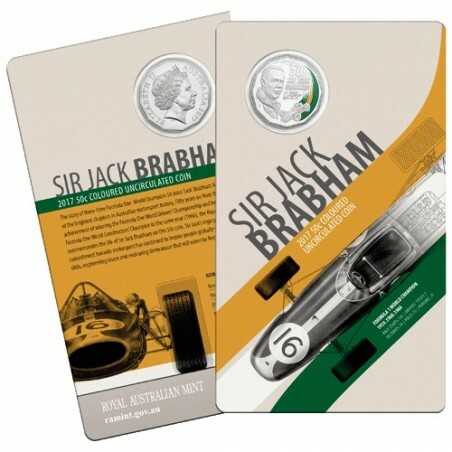 2017 50c Sir Jack Brabham Uncirculated Coin in Card. The story of three-time Formula One World Champion Sir John 'Jack' Brabham AO OBE is one of the brightest chapters in Australian motorsport history. Excelling in a field not know for Australian success, we recognise the achievements of our home grown legend with this dynamic coloured coin design sure to appeal to those inspired by Australian sporting greats. In Formula One racing, the feat of engineering and competing in a race car of one's own making is likely to never be repeated. Winning the driver's championship in such a way would today be considered practically unfathomable. The only driver to achieve such a feat is Australia's own Sir Jack Brabham, winning the Formula One World Championship and Formula One Constructors Championship in 1966. Brabham's career evolved from a well-developed mechanical aptitude to driving when a friend convinced him to race one of the vehicles they had created in 1948. Realising his skills in motor racing extended to being behind the wheel, Brabham went on to win the 1948 Australian Speed Car Championship. 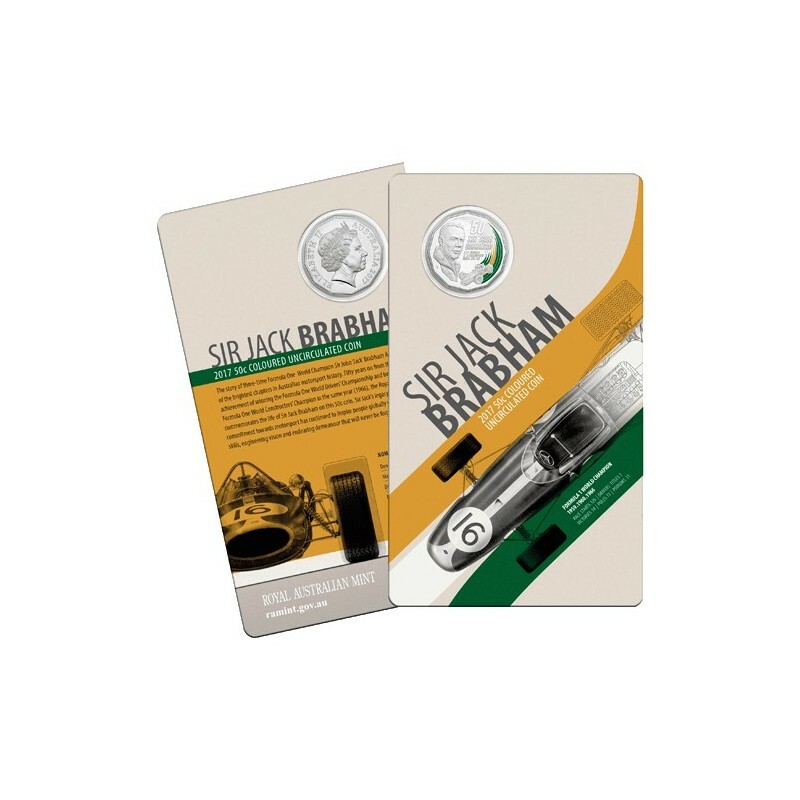 Winning the Formula One World Championship in 1959, 1960 and 1966 Sir Jack Brabham's legacy of achievement continues to inspire Australians of all ages. The reverse of the coin features Brabham's familiar face with his streamlined race car, complete with colour print. This product was developed in collaboration with Brabham Racing, Sir Jack's family-run racing legacy. Each coin is struck to The Royal Australian Mint's Uncirculated standard. The obverse features Her Majesty Queen Elizabeth II by Ian Rank-Broadly.